This past Sunday was my favorite type of day to drive through the Columbia River Gorge. The clouds hung low in the trees, creating a beautiful fog layer. I spotted this beautiful view outside of Stevenson, Washington of the Bridge of the Gods, which spans the river between Oregon and Washington. A spectacular setting, and a beautiful shot! It's well named. It is a pretty spectacular view. Really is a pretty view. The cloud makes a bridge of its own! Oregon and State of Washington is on my "bucket list." I adore this image. You captured it perfectly. Wow, awesome view and shot. Beautiful moody day...Love the lingering foggy clouds amidst the forest. That's a really scenic view! Nice shot of the bridge. Love the foggy hills too. Absolutely beautiful. Visiting from Kim's. 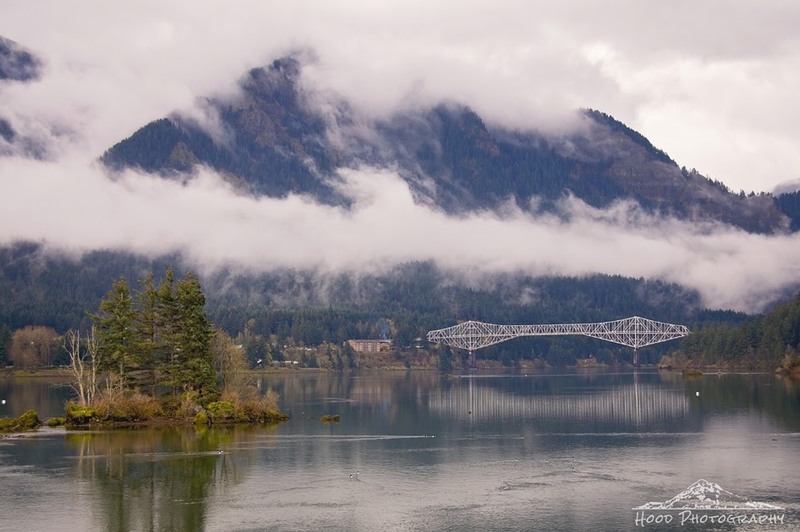 Clouds, mountain, water, bridge, reflections...all so spectacular. I agree, the views along the Columbia are breathtaking! Several years back we stayed at the hotel in Cascade Locks OR, and took some long exposures of the bridge at night... this is a wonderful view of the whole span. Thank you Sarah, for coming by sharing your creative photography on the Weekly Top Shot, #171!